The Uncanny Bairn was included in Baldwins 1895 anthology The Shadow on the Blind and other Ghost Stories. The word “bairn” is used in parts of Scotland and Northern England to refer to a child. The Uncanny Bairn is the story of a sickly child who grows stronger as he ages and develops some “uncanny” abilities. The text contains many words that are regional and/or are no longer used in modern-day English so, in some cases, links are provided for any reader who requires an explanation of what the various words mean. 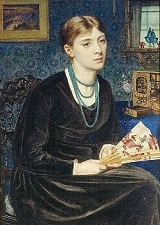 Sometimes credited as ‘Mrs Alfred Baldwin’, Louisa Baldwin was an English novelist, poet, and writer of short stories. She was one the ‘Macdonald sisters’ the aunt of the author Rudyard Kipling and the mother of the British Prime Minister, Stanley Baldwin. The MacDonald sisters were four Scottish women who became famous for the fact that all four of them married well-known men. Louisa’s husband, Alfred Baldwin, was a businessman and a Member of Parliment for the Conservative Party. Louisa and Alfred’s son, Stanley Baldwin, was elected British Prime Minister three times. He holds the distinction of being the only British Prime Minister to serve under three monarchs (George V, Edward VIII and George VI). After the birth of her son, Lousia Baldwin became plagued by bad health and spent much of her time in a bathchair. Due to the fact that she always seemed to recover her strength while on holiday, it has been speculated that Louisa Baldwin may have been a hypochondriac. Lousia Baldwin died on the 16 May 1925. To this day her work is often included in ghost story anthologies. David Galbraith owned a compact estate in East Lothian which he farmed at a considerable profit. The land had passed from father to son for a couple of hundred years. It had always yielded a good livelihood to the owner, but never had it been so highly cultivated or produced such abundant crops as under David Galbraith’s liberal and skilful management. The oats and potatoes grown on his farm commanded the highest prices in the market, and his root crops were superior to any in the district. The large, solidly built, stone house in which so many generations of Galbraiths had lived and died stood in the midst of the property, sheltered by a belt of trees on rising ground from the sweeping east wind, and the laborers’ cottages, equally well constructed to resist the gales that blew across the Firth of Forth, were models of decent comfort. The livestock on the farm was well fed and cared for and the whole property bore evidence to the wealth, thrift, and intelligence of its owner. And David Galbraith’s wife was well-to-do and thrifty like himself. She, too, was the child of a Lowland landowner and farmer, and had brought her husband no inconsiderable tocher* while her industry and housewifely accomplishments might in themselves have served as a marriage portion. She too, like her husband, came of a douce* Presbyterian stock, worthy, upright folk, holding by the faith and practice of their forebears; orthodox and thrifty, worshipping as their fathers had done, and hauding* the gear as tightly, nothing doubting but that to them was especially assigned not only the good things of this world, but also of that which is to come. Galbraith did not marry till he was a middle-aged man. But he had long had the cares of a family on his shoulders without its pleasures to lighten the burden. He was the eldest of six orphan sisters and brothers, to whom he had acted the part of a father, and it was not till Colin, the last and youngest, had left Scotland for a sheep run in Australia, with money lent him by his brother, that he felt himself at liberty to marry. But now that his pious duty towards his family was fulfilled, David Galbraith did not hesitate to take to himself a wife in the person of Miss Alison McGilivray, a lady of some five-and-thirty years of age, with large hands and feet, small grey eyes, high cheek bones, and a complexion betokening exposure to a harsh climate. She was well educated and intelligent, and in talking with her servants and poor neighbors, commonly fell into the comfortable Lowland Scotch that her father and mother had taken a pride in speaking. Only one child was born to David and his wife in the ample home where there was space, maintenance, and welcome for a dozen. Yet this one was a son, and the Galbraiths were not doomed to die out. The boy was christened Alexander, after his two grandfathers, both of whom were Alexanders, so that there was no chance of dispute as to which side of the house should have the naming of the child. But the babe won through the troubles and perils of his sickly infancy, and at six years of age had grown into a delicate slip of a child, with an interesting pair of grey eyes in his pale face, and a bright spark of intellect in his big head. The family doctor, to whose unceasing care Sandie owed his life almost as much as to his mother’s devoted nursing, forbade his parents to attempt anything in the way of systematic education till the boy was eight or nine years of age. Though mother and nurse, actuated by different but equally strong motives, kept all knowledge of the supernatural from the child, there came a day when his father accused them both of poisoning his mind with stories of witches, warlocks and ghosts, and making an uncanny bairn of the boy. When Sandie was seven years of age, a lean and overgrown child without his front teeth, and any comeliness he might possess existed only in his mother’s eyes, a strange circumstance happened that greatly perplexed and distressed his parents. One cold afternoon late in October Mrs. Gaibraith told Effie to take a pudding and a can of broth to an old and very poor woman, called Elspeth McFie, who lived in a lone cottage a mile from the farm, and Sandie was to go with her for the sake of the walk. The trees were already stripped by the autumn gales, to which a dead calm succeeded, and a cold fog had crept up from the sea and brooded over the bare fields, settling on the naked boughs in chilly drops of moisture. The careful mother wrapped a plaid round the boy, and bade him run as he went to keep himself warm. Away sped Sandie along the highroad, driving a ball before him, and running after it to send it flying again with a dexterous blow of his stick, till his pale cheeks glowed with exercise, and he overshot his mark, ran past old Elspeth’s cottage, and had to be recalled by Effie. “Ye maun pit the basket in her hand your ain sel’,” she said, as she led the reluctant child into the dark, close room where the old woman sat shivering by the fire, spreading her skinny hands over the dying embers. But Sandie held back, and neither threatening nor coaxing would induce him to move a step nearer to Elspeth, so that, stigmatizing him as “a dour limb,” Effie was obliged to set the basket on the table herself. “It’s just a pudding and a few broth that Mistress Galbraith has sent ye, for she’s aye mindfu’ o’ the puir,” she said, as she set out the can and bowl before the old woman. Elspeth looked with a bitter smile at the good things spread before her. The ill-favored old woman cackled to herself, displaying a few yellow tusks, the last survivors of a set of teeth that had once been as white and strong as Effie’s. “It’s lang since man or bairn looked at auld Elspeth wi’ sic a gaze. What does the bairn see in an auld wife’s face? Ye suld look at the lasses, Sandie, lad,” and Elspeth stretched out her lean arm, caught the boy by the wrist, and drew him towards her. She was a hideous old woman, and in the gathering twilight, when the red glare of the embers shed a glow on her harsh features, she appeared positively witch-like. Sandie suffered himself to be drawn close to her as one who walks in his sleep, with wide-open eyes void of expression, and then stood opposite her for a moment pale and silent. Before either of the women could speak the child’s voice was heard. Old Elspeth dropped Sandie’s hand and sank back with a groan. “Effie, Effie, hark till him! The bairn has the second sight, and he sees me stricket for the grave, ay, and ye’ll all see it sune! I feel the mouls upon me a’ready! Tak’ him awa’, tak’ him awa’, he’s an awesome bairn!” and Sandie quietly put on his cap and went out into the cold mist. Effie followed him, and relieved her fright and agitation by speaking sharply to the child. “My certie! but ye’ll be brent for a warlock gin ye read folks’ deaths on their faces, and ye’d best haud your clavers!” and Effie said no more, but thought much on her way back to the farm. She was sure that Sandie did not know the meaning of his own words. He had never seen a dead body, and he did not know how a corpse is prepared for the grave, and he certainly had no information on the subject from books, for he could not read. And the appearance he described on old Elspeth’s face did not seem to frighten him. He had gazed at her from the moment in which they entered the cottage till they left it, but with wonder and interest rather than fear. The fright was for Elspeth McFie and herself, and as she watched the child, unconscious of the death-wound he had given, bounding along the road still playing with his ball and stick, Effle shuddered with vague and nameless fears. That night at supper Effie told her fellow-servants of Sandie’s weird words, and they took counsel together whether his mother should be told about it or not, and they decided only to speak to her if anything untoward happened to old Elspeth. It was on Thursday that Effie had been sent to Elspeth McFie’s cottage, and she resolved to go there again on her own account on the following Sunday afternoon. Her native superstitions were strong upon her, though she had never imparted them to her young charge, and she drew near to Elspeth’s cottage with a boding heart. It scarcely surprised her when she entered to find old Elspeth lying dead on the bed, with coins on her eyes and a white cloth bound round her head, precisely as Sandie had seen her on Thursday. Effie hastened home to tell her mistress everything, repeating faithfully every word that old Elspeth and Sandie had said on the previous Thursday, and Mrs. Galbraith listened with a white and awe-struck face. “Ye’ll just say naething about it, Effie; it’ll be a sair prejudice against the poor bairn, and stand in his way, gin folks think Sandie has the second sight,” and Effie did not think it necessary to mention that every servant in the house was acquainted with the result of her visit to old Elspeth’s cottage. But she hinted that if she continued to wait on such an awesome bairn, that might see the death tokens on her face any day, and fright her into an early grave, her wages should be raised in proportion to the danger of her service. And Effie was dismissed, to her own great relief, and from that day forth Sandie became his father’s outdoor companion, to the visible benefit of his health and spirits. But no one was so really alarmed at Sandie’s uncanny remark and its consequences as David Galbraith himself. His grandmother, a Highland woman, had had the second sight, and his father had told him how she lived to become the terror of her family. Her premonitions of death and calamity were unfailingly true, and the spirit within her never enlightened her as to how the impending evil might be averted. She was simply the medium of announcing approaching doom. What if her ghostly gift had descended to her grandson, a barren heritage, that would make him shunned by his kind! Poor Alison Galbraith, finding her husband irritable and unreasonable on the subject of Sandie’s weird speech, sought comfort in pouring out her fears to their minister, the Rev. Ewan McFarlane, who gave ear to her with as much patience as could be expected from a man whose chief business it was in life to speak and not to listen. In the following spring David Galbraith’s youngest brother Colin returned, after an absence of ten years, to spend a few months with his relations in Scotland. His industry had been prospered in Australia, and he was in a better position than he could have attained by any exertions of his own in the old country. He and his nephew struck up a warm friendship together, and it was a pretty sight to see them golfing on the links at North Berwick, the strong man accommodating his play to that of the puny boy by his side, and restraining his speech so that not a word fell from his lips but what was fit for a child to hear. “Hoot, mon! what havers are ye talking? Ye’ve been dreaming!” said Uncle Colin cheerily. “Na, I saw it. It was no dream; I ken weel the difference between dreaming and seeing. Your house has na slates on the roof, like our house ; it was theckit like a hay-rick, and it had a wide place round it covered with another little theckit roof, and windows like big glass doors opened on it. And there was fire all about, and tall grass all ableeze, and sheep rinning hither and thither frighted, and a man with a black beard and a gun in his hand ran out o’ the house and shouted, ‘O’Grady, save the mare and foal! if they’re lost the master will never forgi’e ye!’ What ails ye, Uncle Colin, that ye look sae white?” and the boy looked up in his uncle’s face with wonder. Colin made a poor attempt at laughter, that he might hide from the child how shocked and startled he was ; but as soon as they reached home he told his brother about his son’s vision, and heard from him in return the story of Sandie and old Elspeth. A few days later Colin Gaibraith received a telegram from his head shepherd informing him of the heavy loss he had just sustained from a very serious bush fire, and both he and David were convinced that Sandie was an uncanny bairn. One fine afternoon, some three weeks after Colin had sailed, David having just then no particular work to keep him on the farm all day, proposed for a great treat to row Sandie to the Bass Rock. Oat-cutting would shortly begin, and then he would not have a spare hour from morning to night. But to-day he and his son would enjoy a holiday together, and Sandie was to take with him the small gun that his father gave him on his last birthday, for he was now nine years of age, and high time that he set about learning to kill something or other. All the latent boy seemed developed in the delicate child by the possession of the small fowling-piece, and he blazed away at the rats under the hayricks, and at the sparrows on the roof, to the peril alike of the poultry and of the bedroom windows, “Mother, mother, I’ll shoot ye a gannet and mak’ ye a cushion o’ the down!” he shouted in wild excitement as he set forth on the expedition. Mrs. Galbraith stood on the doorstep watching her husband and son leave the house together, David a stout, tall man in the prime of late middle life, red-faced and grey-haired, and Sandie a lanky lad with pale, freckled face, but with more vigor in his step than the fond mother had ever expected to see. He carried his gun over his shoulder and strode along by his father’s side, glancing up at him frequently to try to imitate his every look and gesture. David Galbraith was fond of rowing, and as it was a very calm day he dismissed the man in charge of the boat, and taking the oars himself said it would do him good to row as far as the Bass Rock and back again. The sea was like a mill-pond, a glassy stretch of water with here and there a wind flaw wrinkling its smooth surface. There was not a wave that could have displaced a pebble on the beach, and great masses of olive-green seaweed floated motionless in its clear depths. To the left, high above them, stood the ruins of Tantallon Castle, bathed in August sunshine, its grey walls taking warmth and color from the glow of light that softened and beautified its rugged outline. Before them the sullen mass of the Bass Rock towered above the blue water, circled by countless thousands of sea birds, the glitter of whose white wings was seen as silvery flashes of light, from a distance too great to distinguish the birds themselves. They were near enough to the shore to hear voices and laughter borne over the water from the grassy inclosure before Tantallon Castle, and lowing of kine* in the pastures, and as they neared the Bass Rock these sounds were exchanged for the squealing of wild fowl and the clang of their wings. To Sandie’s delight he was allowed to shoot from the boat, which he did with as little danger to the birds as to the fishes, and the only condition his father imposed was that he should fire with his back towards him, “till your aim is mair preceese, man.” Though it soon became evident even to the sanguine Sandie that he would bring home neither gannet nor kittiwake, it was a rapturous delight to be rowed about the island by his father, who told him the name of every bird he saw, and pointed out their nests on the precipitous face of the rock. Then David rested on his oars, and the boat scarcely moved on the still water while Sandie ate the oat cake and drank the milk provided for him by his mother, and his father took a deep draft from his flask till his face grew crimson. “Father, gie me a drink, too,” said Sandie, stretching out his hand. Sandie neither spoke nor stirred, and David took comfort in thinking that after all the lad could see nothing uncanny in the water; it was just some daft folly or other he was after, best unnoticed. But when Sandie did speak it was to utter words for which he was unprepared. “Father, I see Uncle Colin in the water wi’ his face turned up to me, and his ‘een wide open, but he canna see wi’ them.” And the boy did not raise his head, but continued to gaze into the water. Drops of sweat broke out on Galbraith’s brow, and he lifted the dripping oars high in the rowlocks and leaned towards Sandie, his red face now as white as the boy’s. But Sandie did not stir. “It’s Uncle Colin that I see floating in the water, lappit in seaweed, and he’s nae sleeping, for his ‘een stare sae wide;” and Galbraith, who would not have looked over the gunwale of the boat for his life, with an oath plunged the oars deep into the water, and rowed with furious strokes. “Ye’ve struck the oar on his white face!” shrieked the boy, and fell back crying in the boat. The oat harvest was plentiful and got together in fine condition, but neither David nor his wife had any heart to enjoy it. They simply lived through each day waiting for the tidings that must come; nor had they long to wait. Nearly a month after Sandie’s vision David read in the newspaper of the safe arrival of his brother’s ship at its destination. It reported a prosperous voyage with but one casualty during its course, which occurred on the twenty-fourth day after sailing, when a passenger booked for Sydney had mysteriously fallen overboard in perfectly calm weather, and was drowned. The gentleman’s name was Mr. Colin Gaibraith, and his sudden untimely end had cast a gloom over the ship’s company. So far the newspaper report, which, brief as it was, was all that David and Alison could ever learn of their poor brother’s fate. They carefully compared the dates, and found that Colin had been drowned three days after Sandie had seen the vision of the body in the sea. “I winna tell the bairn that puir Colin is dead,” said David gloomily. “Ye maun do as ye think best, but I canna mention puir Colin’s name to him.” And it was from his mother that Sandie heard of his Uncle Colin’s death. He listened gravely and thoughtfully to the tidings. “Yes, it was him that I saw in the water,” and that was all that he had to say about the death of his favorite uncle; he asked no question and made no further remark. In the third summer after Colin Galbraith was lost at sea, on a lovely summer evening, Mrs. Galbraith sat at the open window, knitting and smiling placidly as she watched her son at work in his little plot of garden watering the tufts of pinks and pansies. She laid her work in her lap, and her eyes followed his every movement with quiet pleasure. Sandie would make a good gardener. There was not a straggling growth in his plot nor any weeds ; all was neat and trim, and the flower-beds were prettily bordered with shells he had collected on the beach at North Berwick. He was gathering a posy with fastidious care, and his mother knew that it was for her, and thought to herself that if he had been uncanny in time past, he was a good boy, his heart was in the right place. But something disturbed him in his work. He rose from stooping over the bed, dropped his flowers to the ground, and Alison thought he was listening to some far-away sound till a change that passed over his face showed her that she was mistaken. Sandie was not listening, he was seeing. His face grew pale and his features pinched, his grey eyes were fixed while the color faded out of them till they were almost white, and he shuddered as though a cold wind blew over him. Mrs. Galbraith rose silently, and assured by the deep breathing of her husband, who was sitting in an armchair by the hearth, that he was asleep, opened the door softly, left the room, and hurried into the garden. There in the sunshine, surrounded by summer sights and summer scents, stood Sandie, a very image of midnight terror. His mother laid her large, warm hands on his shoulders, and gently shook him. “Sandie, Sandie, if you’re seeing again, for God’s sake say nothing to your father! He canna bear it; ye’ll tell me,” she said in a frightened whisper. The boy gave a sigh, passed his hands over his eyes, and staggered as though he were dizzy. Alison grasped her son firmly by the arm. “Come awa’! if your father wakes and goes to the window he’ll see us; come awa’!” and she hurried the boy through the warm evening sunshine that had suddenly grown cold and dim to her, and led him to a retired part of the garden. The self-controlled, unemotional Alison Galbraith gave a smothered scream as she listened to her son, and, seizing his arm in a passion of fear, with a grip like a vice, said ‘Elspeth McFie was right when she called you an awesome bairn! What for has God in His wrath given me such a child?’ and she shook him off, and left him in his confused misery. If David Galbraith had not been overcome with drink that night, he would have seen that something terrible had occurred to agitate his wife, but when the drunken fit was spent he noticed that she looked white and ill.
“Not I, woman! Do ye expect me to mak’ a midnight ride a mile longer, just to avoid a brae that I ken as weel as my ain doorstep? Kelpie’ll be sober, douce beast, if his master’s not, and he kens every stane on the hill. Ye’ll go to bed, and leave the house door unlocked for me,” and David gave his horse a touch with the whip and away he trotted. Alison stood till the sound of hoofs had died away, and then went back into the house with a boding heart. Sandie returned from school at noon in high spirits, and asked his mother’s leave to bring home a schoolfellow to play with him in the afternoon. It was wonderful how his spirits had rallied since his vision of a few days before. It seemed as though his body had now grown strong enough to shake off the ghastly influence entirely, but his mother was shattered both by memory and apprehension. A dreadful restlessness possessed her as night drew on, and after the shouts of the boys at play were over, and silence fell on house and garden, she slipped out unnoticed and walked in the twilight to the beach. It was high midsummer, when in those latitudes the sunset lingers on the western horizon till in the east the vigorous dawn breaks to quench its lesser light. The crescent moon hung low in the sky over the gently murmuring sea that glimmered mysteriously in the diffused twilight, and the brown rocks loomed dark above the water. A time and a place to suggest eerie feelings to the most unimpressionable; but Alison’s whole mind was so filled with the apprehensions of approaching doom that the scene had no effect on her– she scarcely noticed where she was. The fear that possessed her was inward, and neither suggested, nor could it be increased, by the aspect of familiar things. She did not meet a soul in her restless wanderings. As she opened the house door on her return the clock struck twelve. Oh, when would David be home? He was seldom later than midnight. Alison needed no light, and, creeping softly up-stairs, she entered Sandie’s room, and drawing aside the curtain, by the solemn twilight of the northern night she saw his sleeping face calm and peaceful as an infant’s. Did she grudge him his untroubled slumber, that she would rather have found him awake and oppressed with terror as herself? While she stood listening to the beating of her own heart, that sounded louder than the breathing of her child, she heard the first distant sound of approaching hoofs, and as they rapidly drew nearer she recognized Kelpie’s familiar steps. “Thank God, he is safe home!” she said, and lest her husband should be displeased to find her sitting up for him, she hastened to her room and lighted a candle. The horse had stopped opposite the house, and David had had time to dismount, but he had not opened the gate. Some one might be detaining him there; yet there was no sound of voices to be heard, only Kelpie impatiently striking the ground with one of his fore feet. Alison looked out of the window, but could see nothing for the high wall, and as several minutes passed and still her husband did not come, and the horse stamped with increasing impatience, she slipped down-stairs, out of doors, and across the garden to the gate. So deadly a fear lay upon her spirit that when she flung the gate open and saw Kelpie standing riderless on the dusky highway she felt no surprise, only an assurance that Sandie’s vision was about to come true. “Oh, Kelpie lad, your master’s no far to seek!” she said as she led the trembling, sweating beast towards the stable yard. Then, without calling up any of the men, just as she was, with uncovered head, Alison Gaibraith sped through the dusk and silence of the summer night. “The steep brae by Sir Ewen Campbell’s gates! the steep brae by Sir Ewen Campbell’s gates!” she said to herself as she ran, and when the dark firs and high wall bounding the park came in sight her limbs almost gave way beneath her. Then she reached the great iron gates between granite pillars, and in the twilight she caught sight through their bars of the black avenue within, and heard the wind sigh in the boughs. Alison pressed her hands to her heart and urged herself on. Now a bat cut its zigzag flight through the air and startled her, the white scut* of a frightened rabbit shone out in the dusk as it flashed across her path in search of a friendly burrow, and her echoing steps woke many a sleeping bird and set it fluttering with fear. The next turn in the road would bring her to the foot of the hill, and to something that she dared not name that she knew was waiting for her there. She closed her eyes for an instant, as she rounded the curve of the road and clenched her hands then the soft silence of the summer night was broken by a wailing cry, and Alison Galbraith fell senseless on the dead body of her husband. David was sober that night, but as he rode through the mirk lanes the old horror had overtaken him. He thought that he heard a horseman following hard upon him, and clapped spurs to his beast and galloped down the hill, at the foot of which Kelpie slipped on a rolling stone, threw his rider heavily to the ground, and he neither spoke nor moved again. More Stories by Louisa Baldwin the subject, and she will never know whether the stories of her husband’s uncanny childhood are wild legends or plain truth.